I recently had a chance to have a look at Gregor Bruhn's workshop. Gregor Bruhn is a professional cabinetmaker in Ottawa, and he runs a business called "hand werk", making high end cabinetry in the Ottawa area. What's interesting about his workshop is how it takes a completely different direction from most hobby workshops. 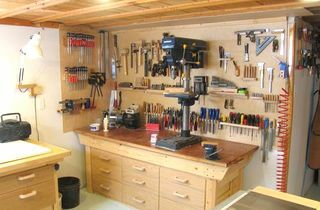 Certainly, if all you read is woodworking magazines, you would have very different expectations of what a professional cabinet shop looks like. 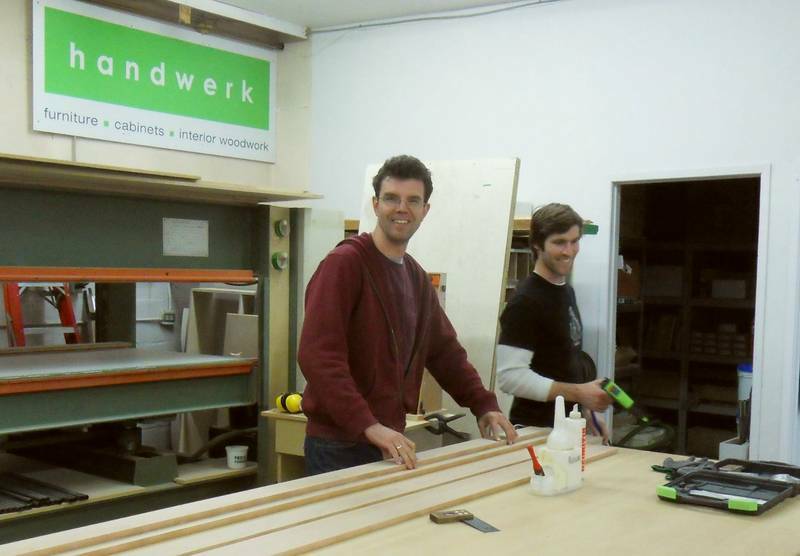 A major difference is that Gregor is a German guy who immigrated to Canada only three years ago, and his workshop, work methods and furniture are more aligned with what is commonly done there. Germans are very attentive to detail in how they build and furnish their houses. Every time I come back from Germany, it feels like we live in poorly made shacks here in Canada by comparison. Good quality starts with good materials. Gregor often uses baltic birch plywood panels for furniture. 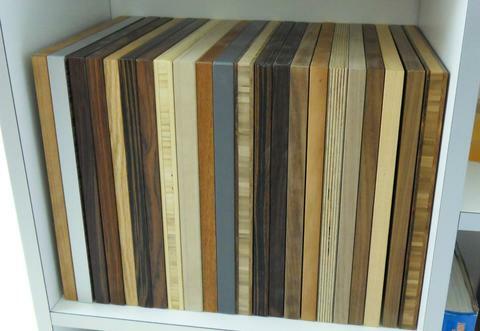 Also, he sometimes these interesting plywood-like sheets of laminated bamboo. 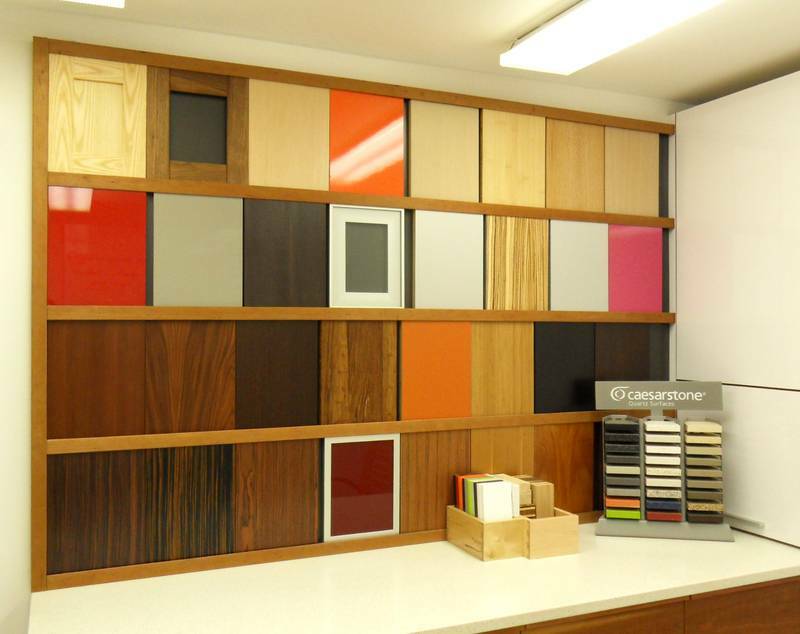 These panels are quite expensive and aren't available in your typical home renovation center. Cabinets are mostly made of panels, and most of the equipment is focused on working with panels. 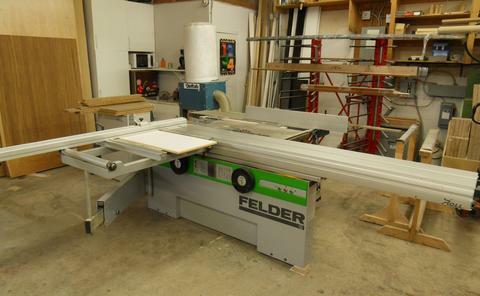 And the ideal tool for working with panels is a "format"-style table saw. This is one is a Felder combination machine, with a jointer / planer part on the other side and a retractable shaper spindle behind the sawblade. It's used as a table saw though. 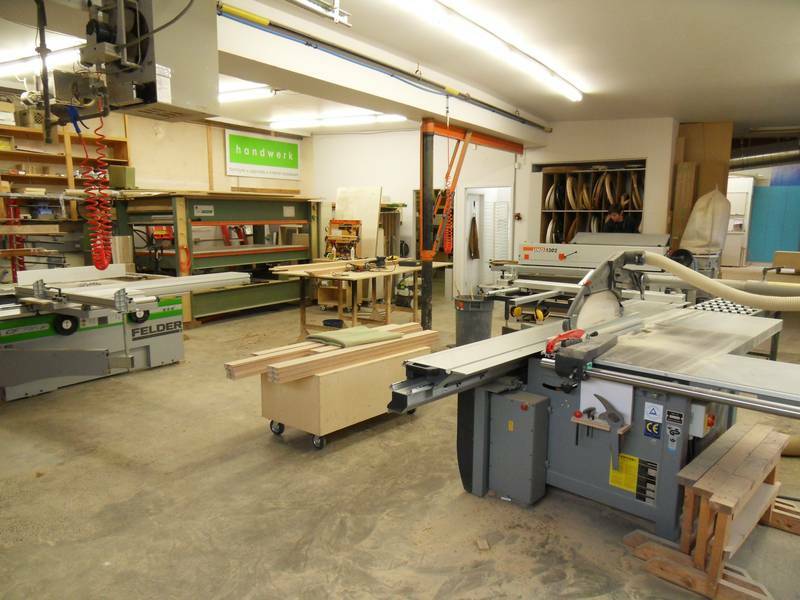 Gregor also has a second, larger, Altendorf format-style table saw. You wouldn't see what we call a "cabinet maker's saw" such as a Unisaw, or even a Sawstop in a professional setting in Germany. These types of saw are considered unsafe, as one tends to stand mostly in front of the saw to operate it. 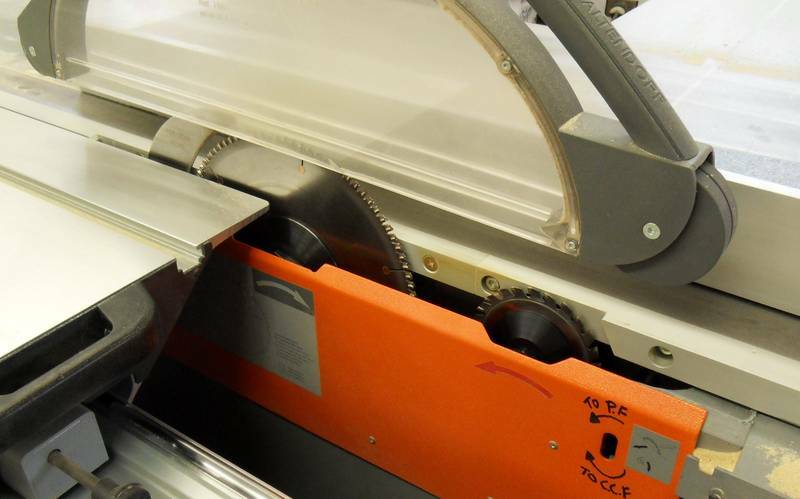 Format-style table saws are designed to be operated from the side, and large sheet goods are usually placed on the sliding table. If one needs to cut up a 4x8 sheet of plywood, that would usually be done by placing it on the sliding table and moving with the table, rather than standing behind the saw pushing the sheet through along the rip fence. 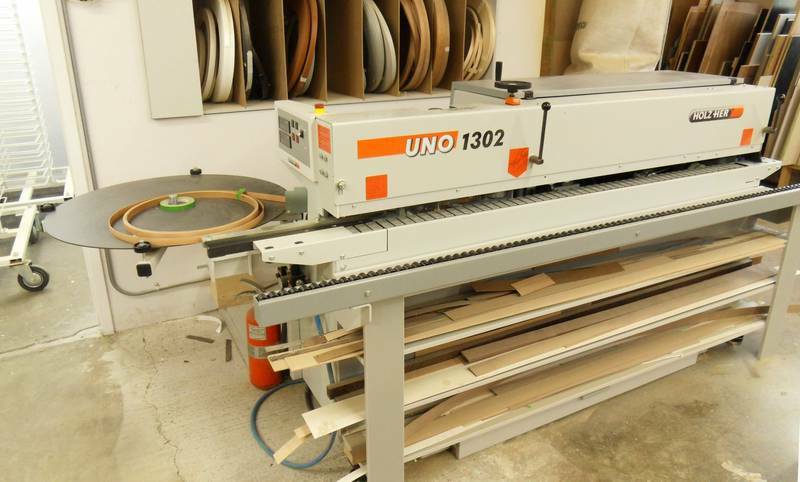 The saw's sliding table has enough travel to rip a full sheet lengthwise. Of course, saws like that don't come cheap, although, apparently, the Altendorf saw that Gregor has can be bought for about 11,000 Euro in Germany, much less than one would pay for it here. Still much more expensive than the best cabinet saw you can buy, but it's a different culture with respect to cabinet making in Germany. Gregor's Altendorf WA8 saw is actually the second smallest model from Altendorf. There's a bit more money for that sort of thing in Germany because there's a bigger market for custom furniture. Houses are considered "forever" and home improvements are primarily for one's own satisfaction. Germans don't calculate "I shouldn't spend more than X dollars on this renovation because it will only add Y dollars to my house's resale value"
So home furnishings are approached differently, and there is a bigger market for custom work, the kind that people in North America would classify as "high end". 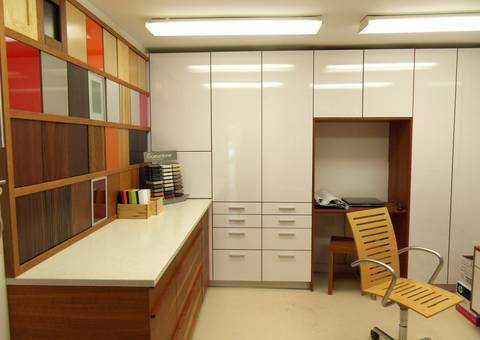 So it is no surprise that Gregor focuses on high quality high end custom work. When you consider the quality, fit and finish of his work, the price is not out of line. It's very different from the "cheap as possible" run-of-the-mill type cabinets that builders will install when they build whole subdivisions. It's also interesting to see different styles. The European fashion is to have flat cabinet doors. You really don't see many raised panel doors on new European kitchens these days. They are all flat. They may use all kinds of interesting exotic surfaces, but they are flat. And I have to say, I often wish the doors in my own kitchen were flat - especially every time I spill something off my counter and onto the doors! Why do we get so caught up on these "traditions"? Why do we need to have painted white cabinet doors made from MDF, with a groove routed in them to badly imitate a raised panel door? Europeans also like things with straight lines, quite often more angular. And this is apparent not just in their furniture, but the machines as well. The typical 14" cast iron frame bandsaw seen here will have the corners of the enclosure rounded. Not so for European machinery. I have never seen a bandsaw in a European context that didn't have a square enclosure. On talking about finishes, I mentioned that "I always just use this water based varnish to finish everything". Gregor's response "You know, that stuff is just as toxic as the solvent based finishes, the main difference is that it doesn't smell as bad, but it will offgas the same and both are toxic to the environment to produce". 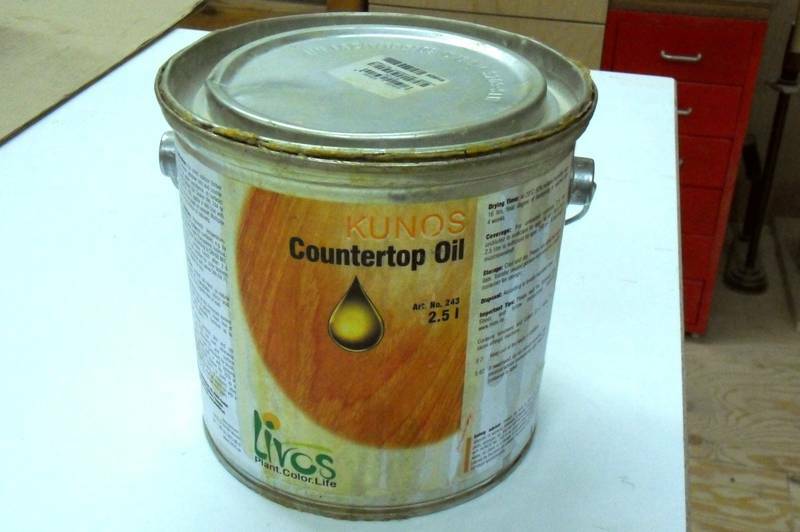 If customers want, they use a lacquer finish - only low VOC, low HAPs, 2 component solvent based lacquers (less offgassing once cured). "Most of our finishes are with organic natural hard oil/waxes from LIVOS (no petrochemicals) 100% nature", Gregor adds. Germans are much more careful and aware of chemical usage.